About love (2011): "I'm a feminist, but I think that romance has been taken away a bit for my generation. I think what people connect with in novels is this idea of an overpowering, encompassing love—and it being more important and special than anything and everything else." 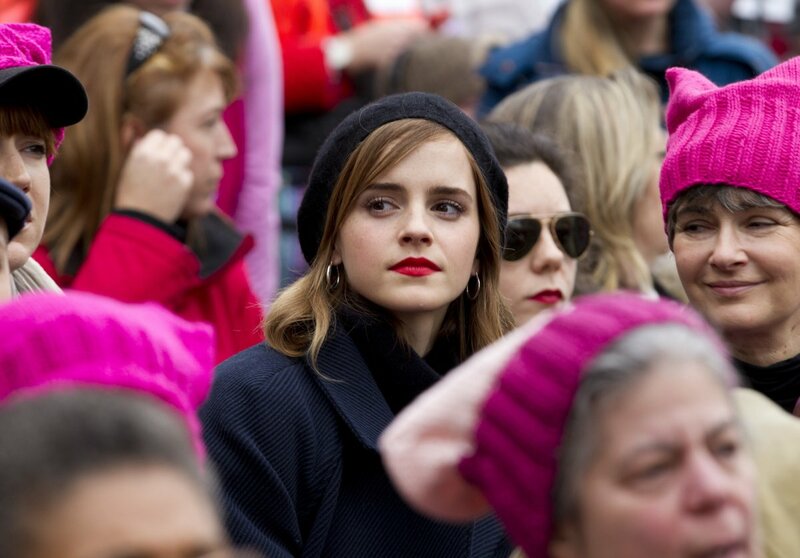 Emma Watson showed her support for women, minorities, and people of all religious faiths, nationalities or gender identities who’s rights are threatened by the new US government by participating in the Women’s March on Washington. 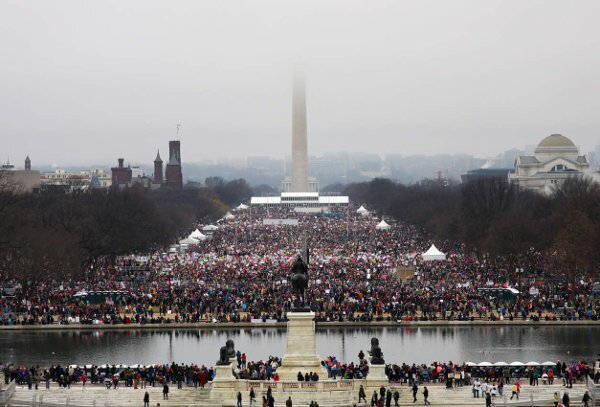 Estimates are that over 500,000 people attended the event, far exceeding the number who were at the presidential inauguration on Friday. 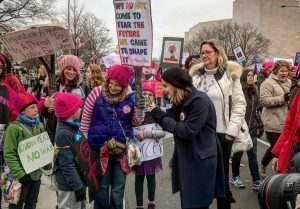 Similar protest marches were held around the world in many countries, with over 2 million participants. 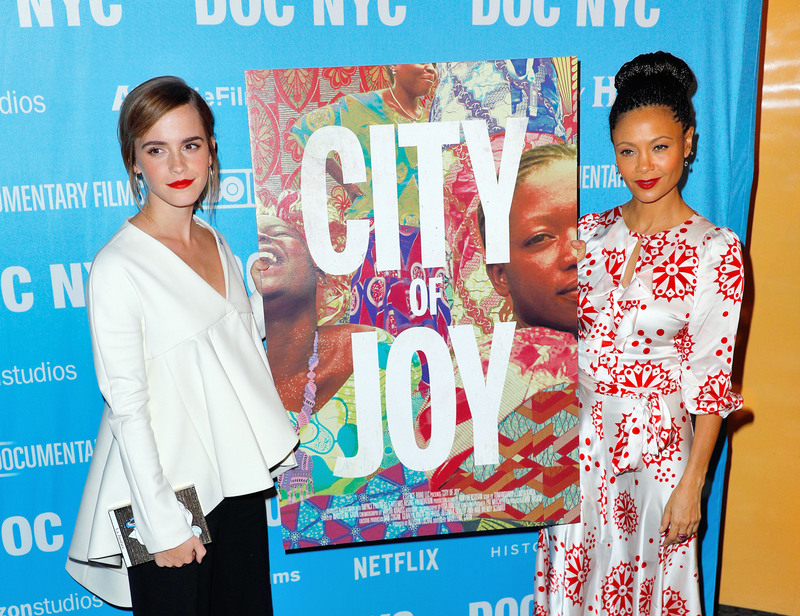 Emma and actress Thandie Newton and some of those followed in the documentary can be seen below. 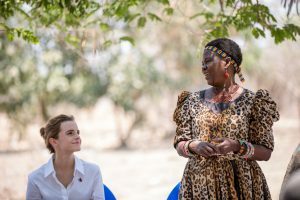 UN Women Goodwill Ambassador Emma Watson visited Malawi this past Monday to “shine a global spotlight on the need to end child marriage”. Malawi has one of the world’s highest rates of child marriage with half of all girls married before the age of 18. Last year Malawi passed legislation raising the minimum age of marriage to 18 and Malawi President Professor Arthur Peter Mutharika has set a goal of fully implementing the new law within 5 years. 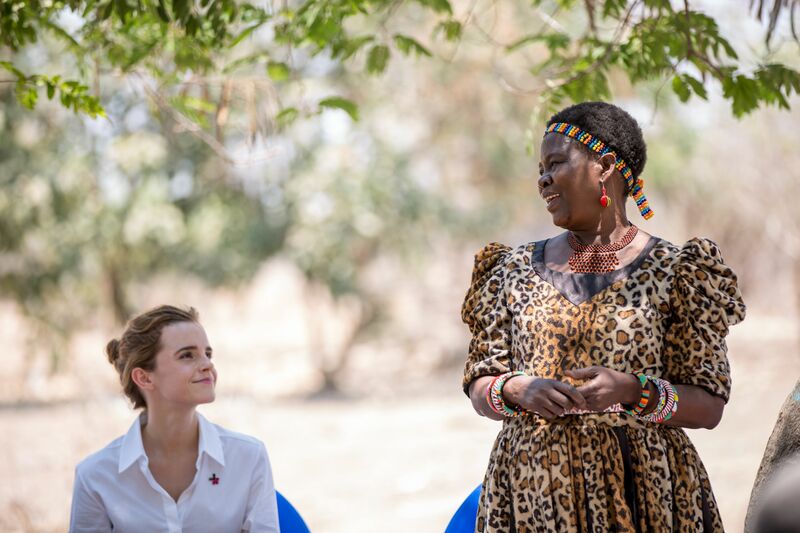 Emma met with traditional chiefs and girls who have returned to school after having marriages annulled. 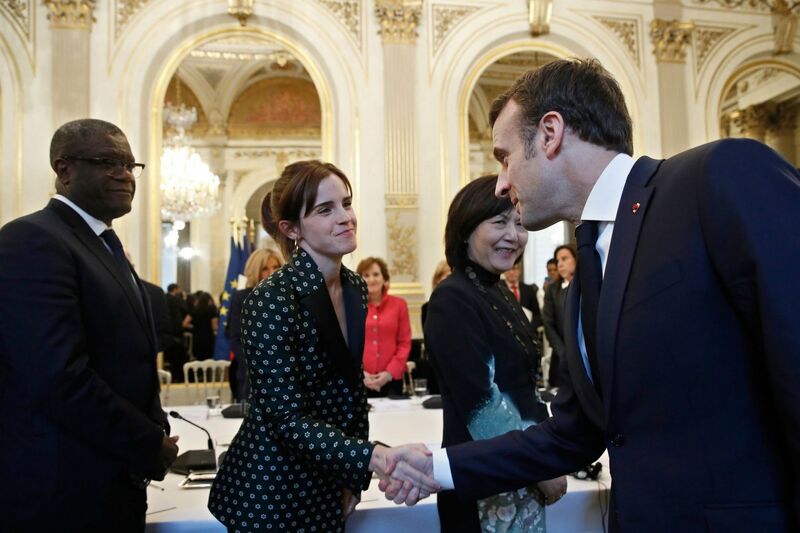 Emma also met with Canadian Prime Minister Justin Trudeau to discuss the HeForShe campaign and his role of HeForShe Youth Ambassador. 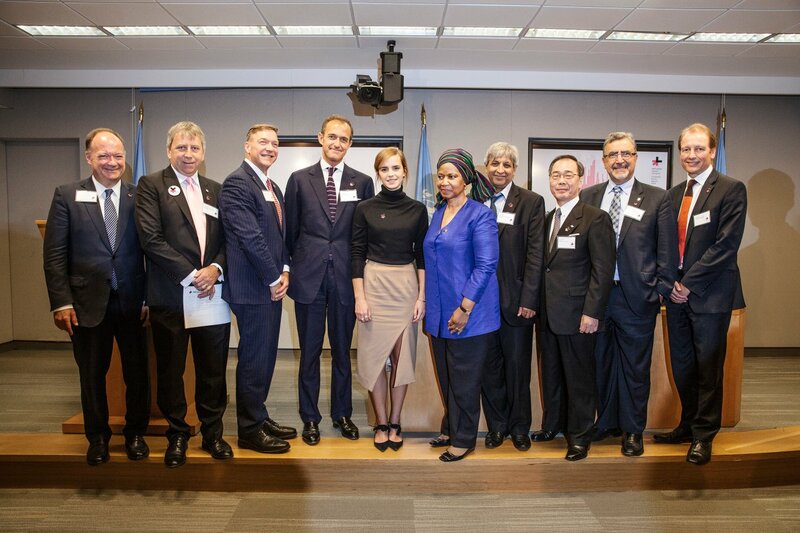 Emma Watson, UN Women Global Goodwill Ambassador, spoke at a reception celebrating the anniversary of the UN Women HeForShe initiative launched two years ago. 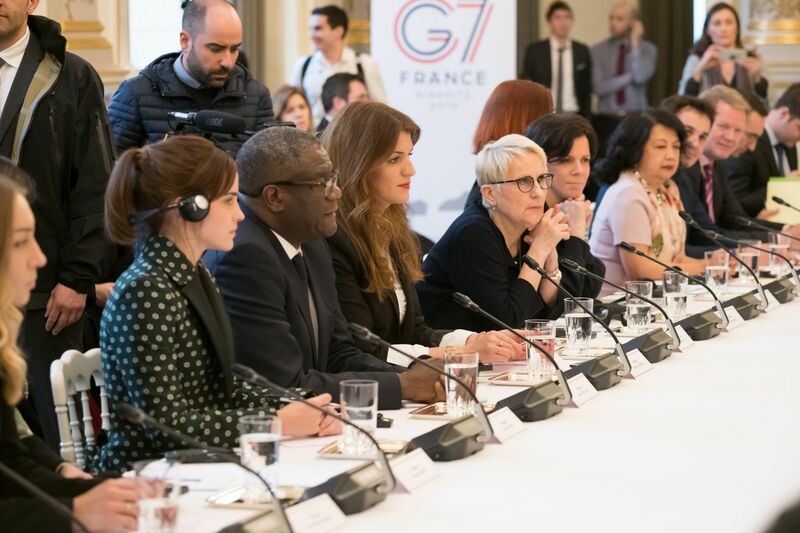 Also speaking were Their Excellencies Sauli Niinistö, President of Finland, Shinzo Abe, Prime Minister of Japan, Peter Mutharika, President of Malawi and Justin Trudeau, Prime Minister of Canada and Phumzile Mlambo-Ngcuka, Under Secretary-General and Executive Director of UN Women. 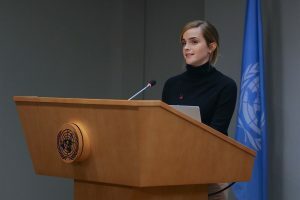 Earlier in the day, Emma introduced the release of the HeForShe IMPACT 10x10x10 University Parity Report. 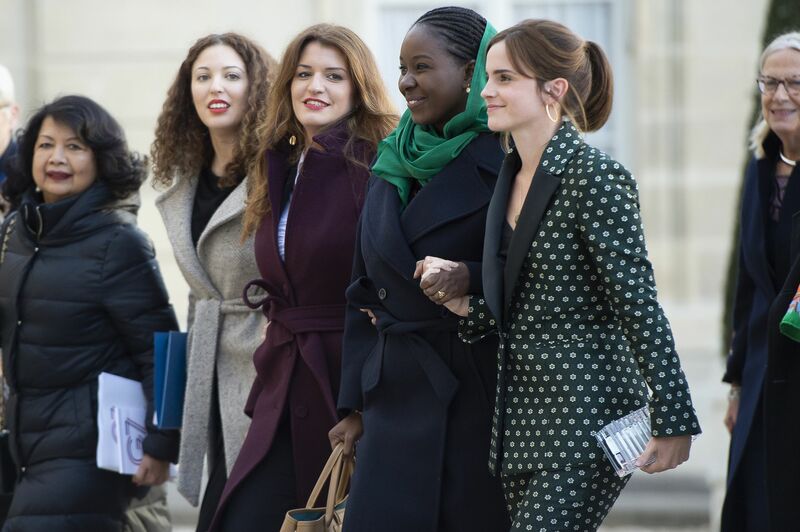 Emma Watson talks about her new film Colonia, her character Lena, and visiting the site of the camp in Chile in two new interviews from Lorraine and Independent. 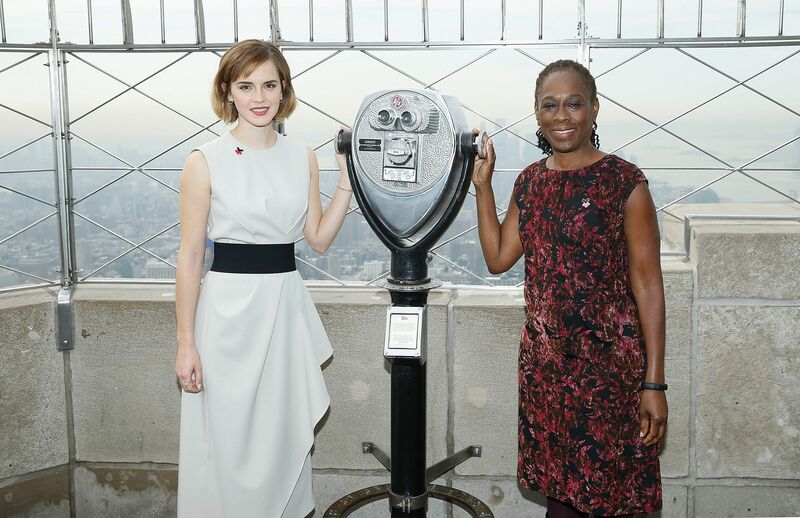 She also talks about being cast as Belle in Beauty and the Beast, her love of fashion, and her work for the UN. Colonia, as The Colony, opens in the UK July 1 in cinemas and on demand. On Tuesday, Emma Watson launched HeForShe’s Art Week in New York City at The Public Theater. 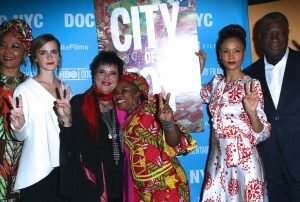 Emma’s introduction was followed by a panel discussion with actor and UNESCO Special Envoy for Peace Forest Whitaker, UN Women Executive Director Phumzile Mlambo-Ngcuka, and First Lady of NYC Chirlane McCray “on the powerful role arts play in shaping behaviours, norms and perceptions that shape our cultural view of gender”. 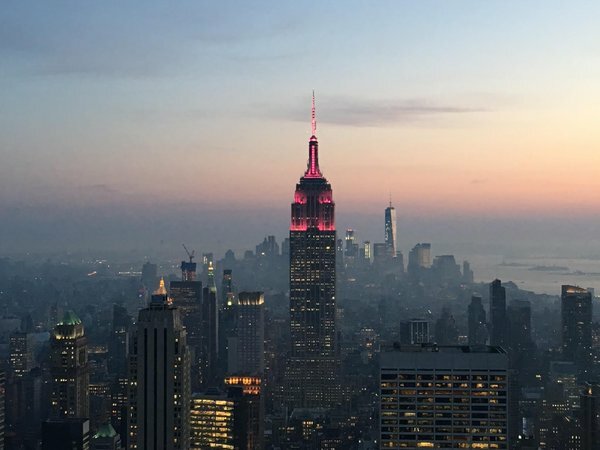 After the discussion, Emma went to the Empire State Building for a lighting ceremony, illuminating the building in HeForShe magenta. Arts Week continues through March 15. 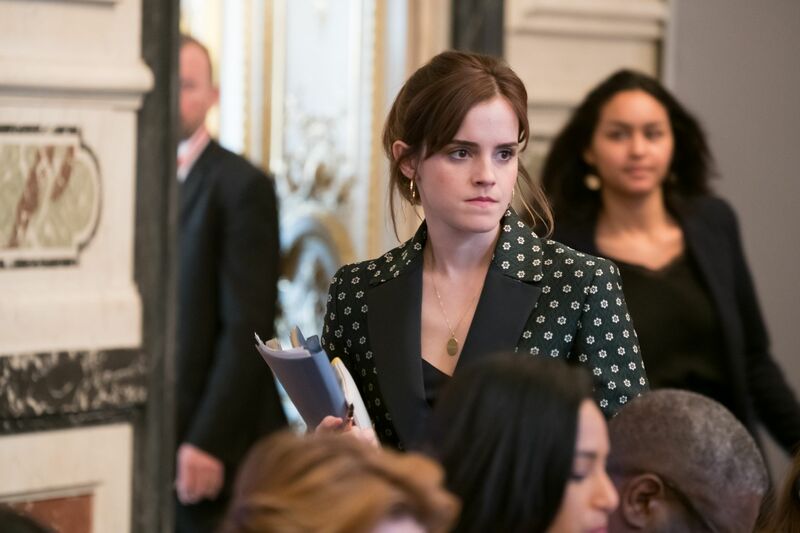 Emma Watson and Tom Hanks will cover a special “Women & Men” issue of Esquire. Emma revealed the cover on twitter, saying the magazine will feature 26 pages on why gender equality is an issue that involves us all, not just women. The April issue goes on sale Friday. 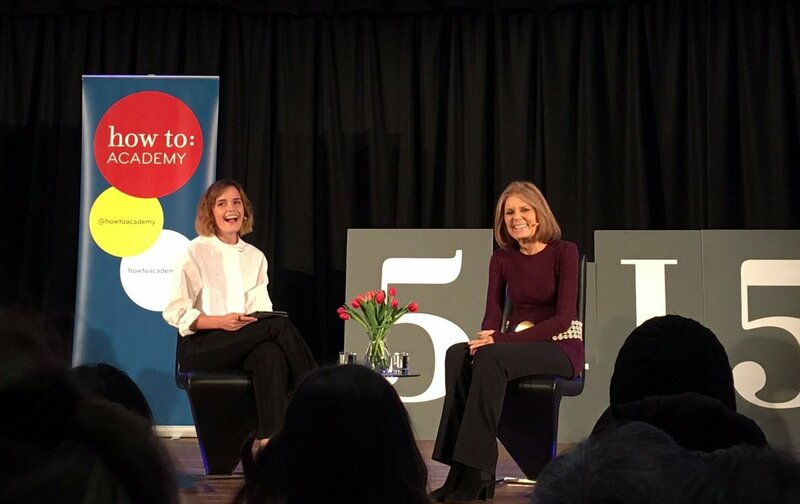 On Wednesday Emma Watson spent the evening with journalist and activist Gloria Steinem talking about feminism and gender equality. 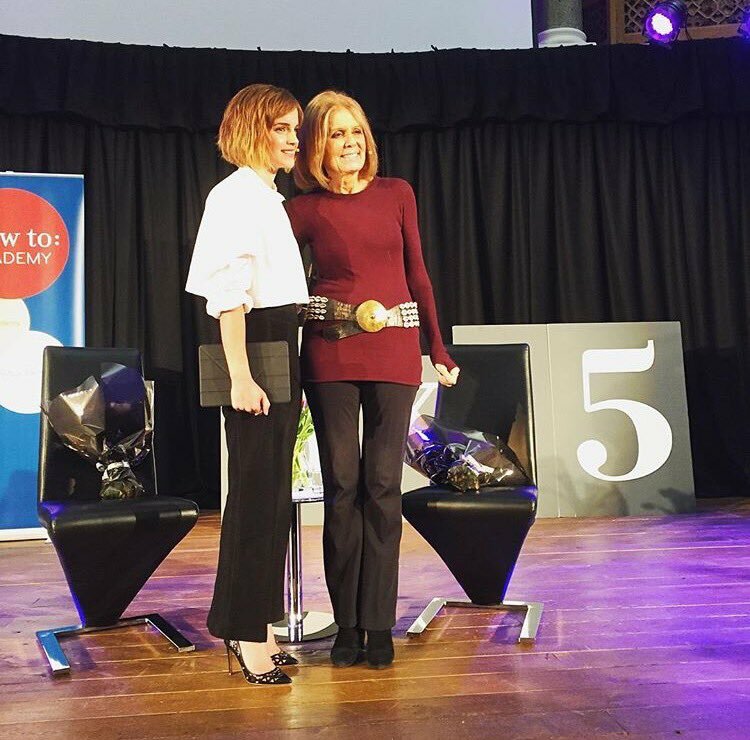 The sold out event was held at the Emmanuel Centre in London. Emma chose Steinem’s latest book My Life on the Road as the first read for her book club Our Shared Shelf. Started in January, her club soon became the largest group on Goodreads with over 100,000 members, twice that of the next most popular. Video of the event has been released on Our Shared Shelf. In a conversation with author and social activist bell hooks, Emma Watson revealed she will be taking a year off from acting. 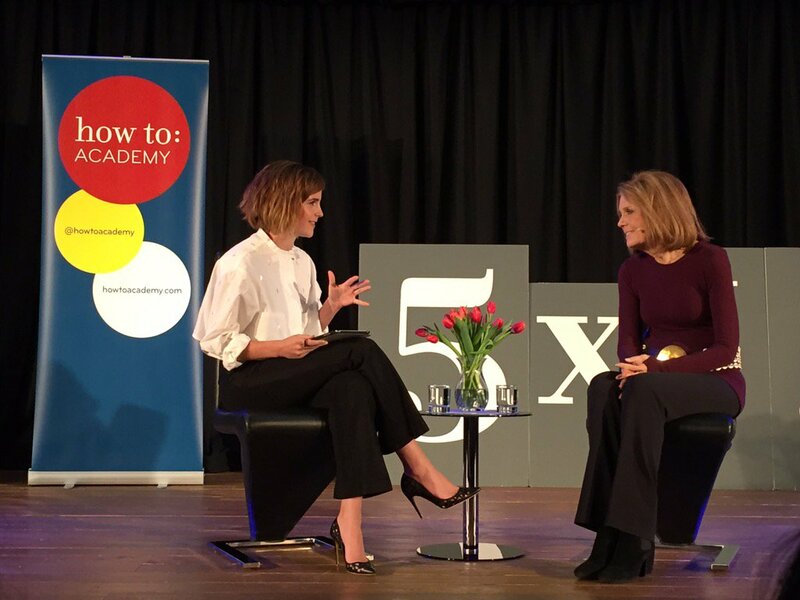 Emma and hooks discuss feminism, reading, and the reasons for her hiatus. 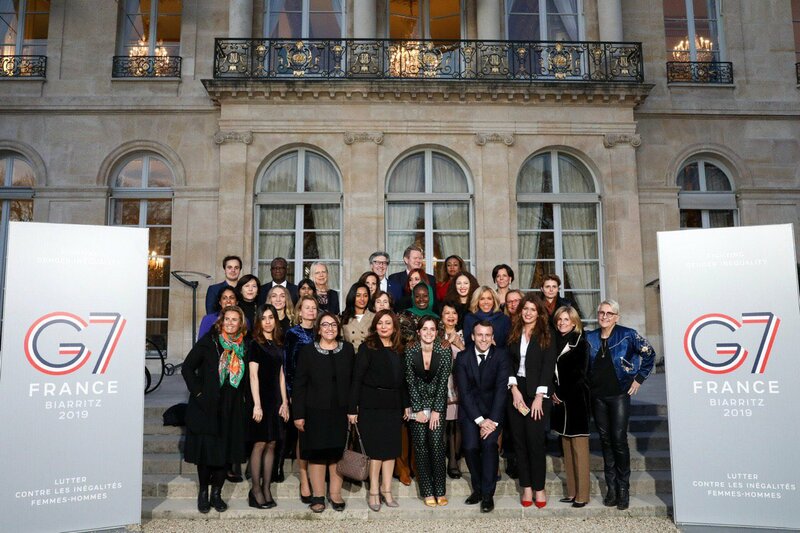 You can read the complete article published in Papermag here.